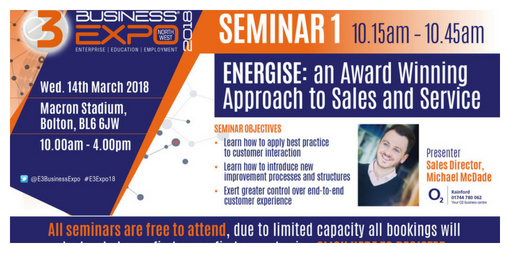 On Wednesday 14th March, the E3 Business Expo will feature a free seminar by Michael McDade, Sales Director for Communications Plus Ltd – one of the UK’s largest O2 franchisees. His presentation will discuss the company’s award-winning approach to sales and customer support. The E3 Business Expo will be held at the Macron Stadium in Bolton. This will be one of four seminars taking place throughout the day. In the 30 minute presentation, Michael will explain the key steps using the acronym ENERGISE. He will also explain how the approach was first devised, how it was implemented across the business, and how it evolved to become an integral part of company’s success. The seminar should be of interest to sales managers, customer services staff and anyone involved in customer-facing operations. It should also be of value for those planning to introduce new processes and structures to bring about improvements in business performance. In addition to the seminar, the one-day event will also feature three other presentations, speed networking opportunities and an exhibition hall with over 70 stands. The one day event will run from 10:00am to 4:00pm and entry is free. Details of the seminar programme, exhibitors and visitor registration can all be found here.